It used to be that accepting an advance on an unwritten novel was as good as admitting failure before the work is even finished. Can you imagine blue-blood novelists Edith Wharton or Henry James taking a check before finishing their books? Recently digitized by the University of South Carolina, the lined notebook, which the writer probably packed with him on all of his travels, paints a picture of a pragmatic businessman repeatedly on and off the wagon. Sound like Gatsby? Maybe a little. The famously hard-drinking Fitzgerald must have done his admin work after the hangover wore off and before happy hour. 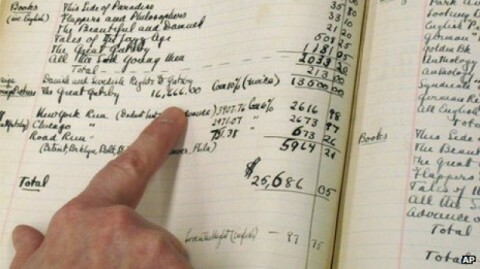 He meticulously noted every penny of every commission earned, dividing the book into five sections: a detailed "Record of Published Fiction," a year-by-year accounting of "Money Earned by Writing Since Leaving Army," "Published Miscelani (including novels) for which I was Paid," an unfinished list of "Zelda’s Earnings" and, most interesting of all, "An Outline Chart of My Life." By the last entry, the state of Fitzgerald’s life is grim—“work and worry, sickness and debt.” The book reads like a whirlwind of drinking, writing, travel and jet-setting. Fitzgerald holds his gaze steady on social dynamics, noting gatherings and arguments with friends alongside the notes about his creative bursts and dry spells. Kate Rix writes about education and digital media. Visit her website at and follow her on Twitter @mskaterix. Jet-setting? Fitzgerald died in 1940. There were no jets at all then, much less public air travel on jets!